Time to dust off your magnifying glass and get solving clues, because Boku Slots loves nothing more than a mystery. Playtech has taken the legend created by Sir Arthur Conan Doyle and transferred that mysterious tale into Sherlock Mystery; call us intrigued! 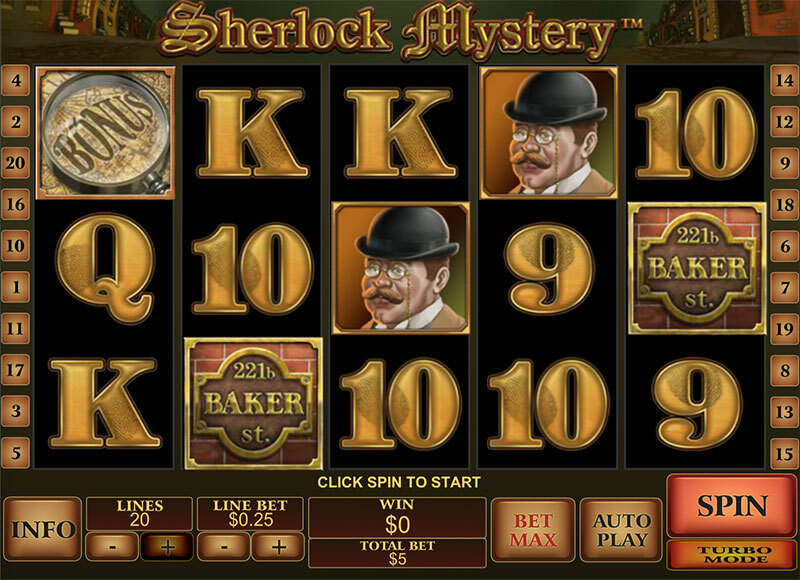 Sherlock Mystery is a 5-reel, 20 pay line slot offering an RTP of 94.09%, for all who dare to take on the case. Set against an eerie London backdrop, the game seems very simple in design and offers basic background sounds as well. Fear not, there are some saving graces in Sherlock Mystery in the form of some very interesting bonus features. The symbols are all related to Sherlock himself, including a magnifying glass, Dr Watson, evil Professor Moriarty and Mr Holmes himself. Bet Amounts – Betting begins at 20p per spin with all lines activated and can be increased to £20 per spin. You can of course amend the lines in play and the line bet amount to suit your needs. You will find these options to the lower left hand side below the reels. Wild Symbol – Dr Moriarty is your wild symbol and he will substitute for all other symbols except the scatter and bonus. He is also your highest paying symbol within Sherlock Mystery and will offer up a coin win of 1000, if 5 wilds are landed on an active pay line. Scatter Symbol – A 221b Baker Street wall sign is your scatter symbol and 3 or more of these anywhere on the reels, will trigger the bonus spins feature. Scatter wins will also be applied to any line win that the scatter helps to form. Bonus Symbol – Alongside the scatter and wilds there is a bonus symbol. You need to land 3 of the magnifying glass symbol anywhere on reels 1, 3 and 5, to trigger the bonus round. Bonus Spins Feature – An allocation of 10 bonus spins will be given, once you have landed three or more scatters on reels 1, 3 and 5. As well as your spins you will be given the revolver wild, which when forming part of a winning line will award a x2, x3 or x5 multiplier to that win. Bonus spins can be retriggered by landing 3 or more scatters during the bonus round. There is no limit to the amount of times the feature can be retriggered and the other bonus games are also able to be triggered during this feature too. Crime Scene Bonus Feature – Upon triggering this feature you will be taken to a new screen and offered a crime scene to investigate. Choose pieces of evidence from the scene and each one will have a coin amount allocated to it. Pick evidence until you uncover one that says collect which will end the round and your winnings will be added to your balance. Sherlock Meets Watson Feature – This feature is played in all aspects of Sherlock Mystery. Land Dr Watson on the immediate right of Sherlock anywhere on the reels to win this feature prize. If you manage to achieve this, it is going to award you a x3 multiplier on your bet amount. Sherlock Mystery doesn’t seem to offer a lot by way of design and certainly with its low RTP gives off a bad feeling. But for those of you willing to investigate further, you will see that it has so much more to offer. The wins come fairly often in the main game and with the added feature of Sherlock meets Watson landing more often, it can boost those wins greatly. But the bonus spins are where it gets interesting as they can be triggered multiple times. Whether you are a fan of the genre or not, we are sure the game will win you over as it did with us.